We aim to provide the best possible service and the most appropriate product (or mix of products) for each specific installation, so we are not tied to any particular technology or manufacturer. We are able to advise, design, install and commission all heat and power technologies for buildings. Don't guess - measure. Always carefully analyse your current and future energy use. Ensure you have a clear plan to reduce it and then understand what the expected mixture of heating, cooling and power needs will be. It is a requirement of the Microgeneration Certification Scheme that the requirements are calculated using the Government's Standard Assessment Process (SAP). Think outputs not sizes. A renewable energy system's efficiency is measured by its outputs, so always consider overall system performance and how it is going to work with your existing systems. A compliant quotation must provide you with this information. Two apparently same sized systems could give very different annual performance figures depending on how it is designed and installed. One solution does not fit all. Your project is unique. The right solution depends on a number of factors, including the type and condition of the building, its location, orientation, neighbours, site access, grid access and many other considerations. Make sure you think about heat and hot water first, as this is often the biggest energy use ina building. Only when the requirements and the options have been properly assessed can a shortlist of candidate solutions be evaluated and a proper business case and design be produced. Be prepared to change your habits. A renewable energy system will be taking advantage of free or cheap sources of energy but cannot be turned on at the flick of a switch. You will become much more aware of the environment when you start to see how your own energy generating unit performs. 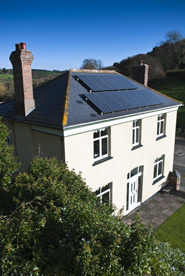 Not only will you want to take advantage of free hot water or free electricity when the sun comes out, but you will find yourself switching things off when they aren't required and even giving guided tours of your own energy generation plant.